New Delhi 23 June 2017: Central government today announced enhancement of rates of Cash Awards for the outstanding sportsperson who achieves 1st, 2nd & 3rd position in the National/ International Sports Tournaments held by respective Federations. As directed to refer to office letter no. 11-8/87-WL&Sp. 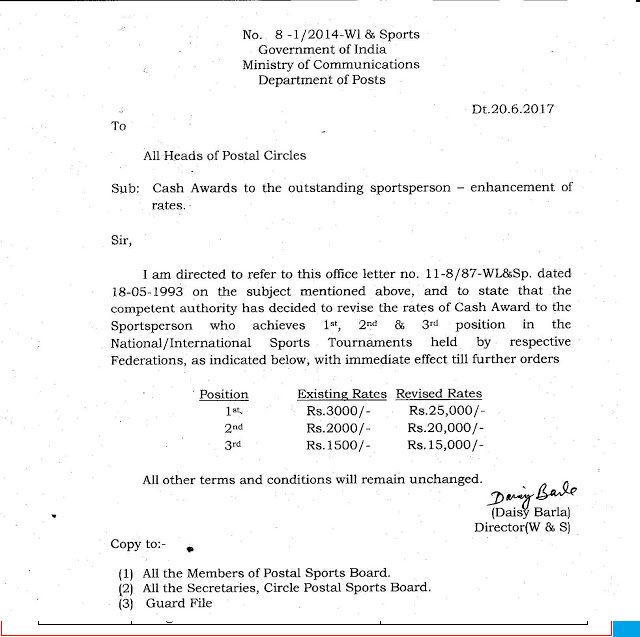 dated 18-05-1993 on the subject Cash Awards to the outstanding sportsperson - enhancement of rates, by Government of India, Ministry of Communications, Department of Posts directed to All Heads of Postal Circles on 20 June 2017 and to state that the competent authority has decided to revise the rates of Cash Award to the Sportsperson who achieves 1st, 2nd & 3rd position in the National / International Sports Tournaments held by respective Federations, as indicated below, with immediate effect till further orders. Govt enhanced of rates Cash Awards for the outstanding sportsperson Cash Awards for the outstanding sportsperson - enhancement of rates: Department of Posts Order Cash Awards to the outstanding sportsperson - enhancement of rates.who achieves 1st, 2nd & 3rd position in the National / International Sports Tournaments held by respective Federations.